"The Maverick Diplomat 独断的外交家 (dú duàn dè wài jiāo jiā)"
The initiator of the Shu Han 蜀汉 Sun Wu 孙吴 alliance, Lu Su was the man who sought a merger with Liu Bei 刘备 to resist the marauding army of Cao Cao 曹操. Lu Su knew that the alliance was the only chance that both forces had of survival, and thankfully, so did Zhuge Liang 诸葛亮. Lu Su initiated contact with Zhu Ge Liang and brought him back to Sun Wu to convince Sun Quan 孙权 to fight Cao Cao. However Zhuge Liang's cunning was beyond Lu Su's ability to manage, and Zhuge Liang insulted all of Sun Quan's advisors, Zhou Yu 周瑜 and even Sun Quan himself, while still succeeding to form the alliance. The minor ruckus caused Lu Su significant stress, but he was relieved nonetheless that his objective was met. 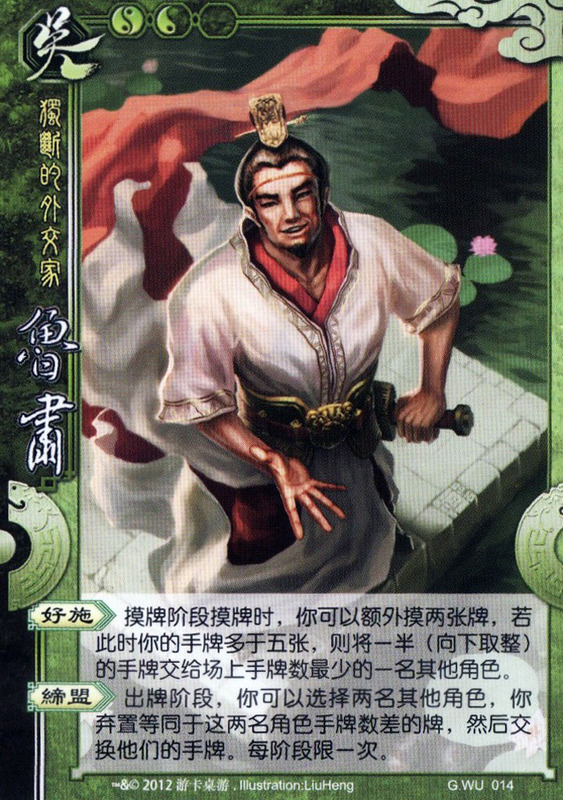 An able and loyal talent, Lu Su took over Zhou Yu's post after the latters death, but Lu Su made a mess of things when he vouched for Shu Han returning Jing Zhou 荆州 to Sun Wu. Liu Bei repeatedly procrastinated returning the strategically important Jing Zhou and the this quickly built tensions between the two kingdoms. The struggle for Jing Zhou eventually led to the fall-out of the allegiance and open war between the these two superpowers. Character ability 1: "Altruism 好施 (hào shī)"
When you draw cards during your drawing phase, you can draw two additional cards. If you have more than five on-hand cards as a result, you must give half of your on-hand cards (rounded down to nearest integer) to another player with the smallest number of on-hand cards. Character ability 2: "Alliance 缔盟 (dì méng)"
During your action phase, you can choose 2 players (other than yourself) and discard as many cards as the difference between the number of on-hand cards between these 2 players. Then exchange their entire set of on-hand cards. Limited to one use per phase. "Altruism" has a very interesting link. In the story, Lu Su's charitable nature led to him "lending" Jing Zhou to Liu Bei, however Lu Su's altruistic nature goes much further than the story. The historical Lu Su was extremely charitable and constantly donated his assets to the poor in the time of extreme chaos (during the initial fall-out of Han Dynasty). He won the hearts of his citizens and it became his platform to rise to a state-level official. "Alliance" needs little mention as his venture into Shu Han was the seed that grew into the Shu Han Sun Wu alliance. However this ability seems to have an antagonistic nature rather than the cooperative nature in the true sense of the word. It sets up a win-lose scenario rather than win-win. The mechanism of “Altruism” comes from another story. Being a wealthy merchant, Lu Su possessed two full granaries of rice. 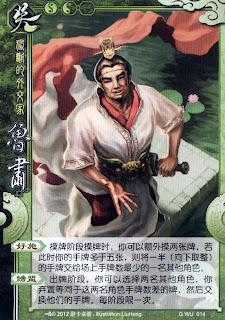 When Zhou Yu rallied armies, Lu Su gave him one granary without hesitation, thus coming the effect “giving out a half of on-hand cards (resources)”.